Price Comparison plots a second stock or index on the price chart. The scale of the second stock or index is adjusted so that both price lines commence at the same point on the left of the chart. Price Comparison (Unadjusted) makes no adjustment to the scale. Price Comparison (Intercept) adjusts the scale of the second stock or index based on the relationship between the two prices on a selected date. The scale of Price Comparison is adjusted each time that you change the time frame — so that the two lines still intercept at the left edge of the chart. This maximizes use of the available chart space, but is impractical if you wish to draw trendlines or captions on the chart. Price Comparison (Intercept) is suitable for drawing trendlines and captions provided you do not adjust the intercept date. Users must also remember to select a fairly recent date. If no date is selected, the earliest possible date is used. Proctor and Gamble is charted with Price Comparison to Johnson & Johnson. 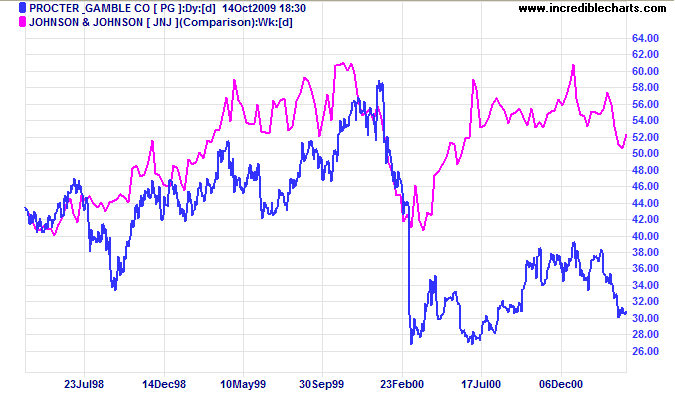 Observe how the two stocks perform relatively evenly over 1999. Both declined for the first two months of 2000 (this was in line with the Dow) before PG's sharp fall in early March after an earnings disappointment. 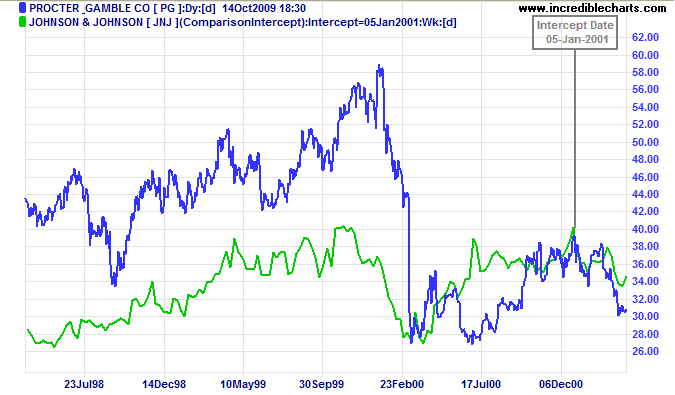 Proctor and Gamble displays Price Comparison (Intercept) with Johnson & Johnson, and an intercept date of 5-Jan-2001. Selection of a more recent intercept date enables comparison of relative performance going forward. Ten-year and 3-month treasury yields are compared using the same price scale on the chart below. 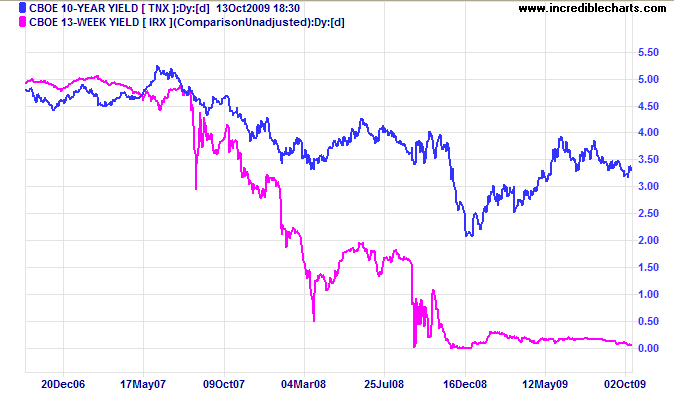 Comparison of two interest rates would be distorted if charted with either of the other Price Comparison options. Save the settings using ">". Set up of the Price Comparison (Intercept) indicator is very similar, except that you must remember to select a recent date for the intercept, else the earliest possible date is used. The Price Comparison line is calculated using the ratio of closing price to that of another security/index, on the first day of the chart. This means that the starting point of the Price Comparison will vary according to the Time Period selected. The line may appear to move if you change time periods; but the slope remains the same. Price Comparison (Intercept) performs a similar calculation, but on a selected date. If no date is selected, the earliest possible date is used. If the date selected is not a trading day, the next trading day is taken as the intercept date.